Buy Sojade Organic Soya Drink Calcium 1lt in the UK from our online shop or directly from our independent Scottish store. Soya alternative to milk is a healthy way of adding soya to the diet. Or for those intolerant to lactose and milk. This dairy free alternative to milk can be used for everything. Can be drunk on its own, or added to smoothies or adding to tea or coffee. Milk but without the cow! Made from soya grown in Europe. Soya drink* 96% (natural spring water, hulled soya beans* 7,5%), apple juice concentrate*, seaweed (Lithothamnium calcareum)**, sea salt. * Organic farming. **Naturally rich in calcium. It takes a few days to get a sourdough starter going but once it’s active you can mix up your vegan pancake batter in the evening, let the magic happen overnight and cook these chunky pancakes for breakfast. This recipe contains 300ml vegan milk. Where can you buy real Sojade Soya Drink Calcium safely online? 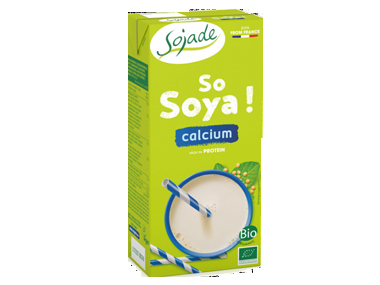 If you are wondering where you can buy Sojade Organic Soya Drink Calcium 1lt safely online in the UK, then shop with us. Sojade Soya Drink Calcium - Sojade Organic Soya Drink Calcium 1lt in Dairy Free Drinks & Creams and Drinks.